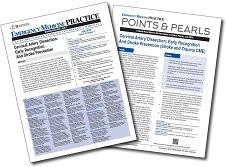 This stroke CME resource, delivered in print and online digital formats, is designed to enhance best practices in acute stroke care by providing an evidence-based review and analysis of the current literature. It includes 8 stroke-specific AMA PRA Category 1 CME Credits™ (CME expires 3/1/20). This multimedia CME program focuses on 6 of the highest-risk presentations and complaints you face in the ED: traumatic brain injury, aortic dissection, appendicitis, TIA and stroke, spinal epidural abscess, and testicular torsion. 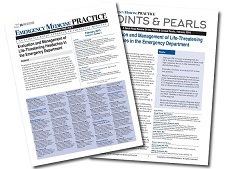 This audio download is a 60-minute easy-listening review and summary of popular topics covered in the Emergency Medicine Practice journal. (It includes 1.25 AMA PRA Category 1 CME Credits™ (CME expires 6/1/19).